I have a drain field, do I need to pump my tank? YES! Why? You need to remove the solids that accumulate in the tank, if you don’t, the solids will flow through the tank and plug up the drain field (soil absorption area). The fix for a plugged drain field is typically a new septic system. 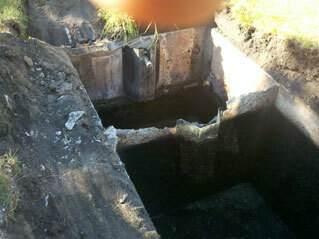 The old adage “An ounce of prevention is worth a pound of cure” certainly applies to septic systems. Why do you use an agitator when other companies don’t? Because the goal is to get the solids out of your tank, watch our video, simply pumping the tank, or even back flushing, doesn’t get the solids out, if you don’t get the solids out, you are wasting your money! We recommend yearly if you have a garbage disposal or once every two years for a family of four, but never go more than three years between cleanings. If you like you can use the University of MN calculation sheet. have your system maintained regularly. spread out your laundry over the entire week. compost your garbage instead of using a garbage disposal. learn the location of your septic system and drain field. allow anyone to drive or park over any part of the system. pipe your sump pump or drain tile (ground water) into the system. pour harsh chemicals down the drain. flush cat litter, cigarette butts, or coffee grounds. What should I do to prepare for winter? Mark your tank with a lath or 5 gallon pail. Let the grass grow long over the drain field area. Keep traffic off of the drain field area. Fix anything that drips water, faucets, toilets, & furnaces. Replace any broken caps on the tank or drain field.